The New Year is a time where many people wipe their slate clean and start fresh. With most resolutions being directed at self-improvement, it’s important you don’t forget improvements to your home. 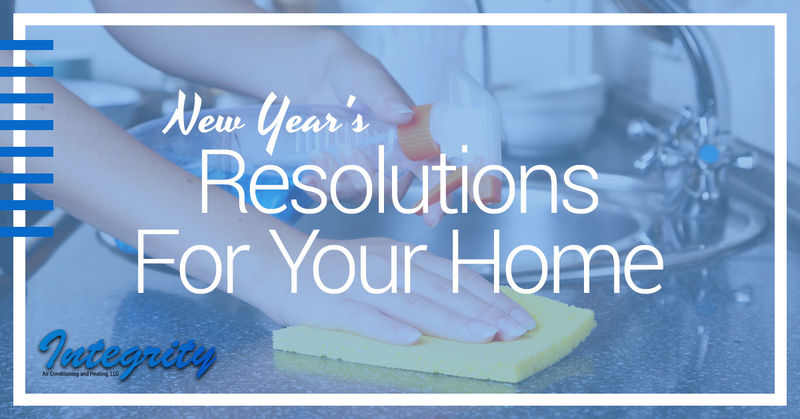 We’ve gathered some resolutions to get your home ready for a new year. Take the first step by calling us at Integrity AC and Heating to get your HVAC system checked. As Phoenix’s HVAC gurus, we’ll help your house feel like home in 2018. Resolve to make your home safer for your family. The first thing you should do is get your home checked for Radon, a colorless, odorless gas that causes lung cancer. You can do this test yourself with a $20 kit from your local hardware store, so it’s easy to check off the list. If you don’t already have one, install a carbon monoxide detector. While it’s standard for smoke detectors to be installed in a home, carbon monoxide can be far more dangerous due to how sneaky it can be. Having a detector in your home will give you peace of mind. Ensure your home has vents in every bathroom and the attic. Without those vents, mold can develop and cause your family to get sick. Have an HVAC professional check your duct system for leaks and replace your air filters to ensure your home has great air quality. If you have an older home, built before 1978, it’s important to have it tested for lead paint and asbestos. A common New Year’s resolution is a desire to save money, and your home can be one of the most costly parts of your life. By making a switch to energy efficient appliances, you won’t just be saving money for years to come, you’ll also make a positive impact on the environment as a whole. You can also change some of your daily habits with a goal of being more energy conscious such as, turning off lights when you leave a room, using energy efficient light bulbs and shower heads, and watering your yard less can all have an effect on your energy bills. Consider installing a programmable thermostat to control your air conditioning and heating whether you’re at home or away. No sense in heating an empty house, right? It’s always nice to have a clean home, but it can feel daunting unless you stay on top of it. Don’t let tasks stack up until they feel insurmountable. Instead, have a schedule that goes into daily, weekly, and monthly cleaning that needs to be done. Delegate these jobs to your family so it’s not all piled onto one person’s shoulders. Dishes need to be put in the dishwasher every day, dirty clothes need to be in a hamper, and clean clothes are hung up or put away in a dresser or closet. Your home may have areas that get dirty easier, so focusing your efforts there instead of unused rooms will be a better use of everyone’s time. Many people make a resolution to spend more time with friends and family. You can make some small changes to your home that make it ready to have guests over. Don’t assume this means a massive renovation. Adding some houseplants, freshening up the living room with a new area rug, and adding in some throw pillows can go a long way in making your home feel more inviting. Try setting up the furniture so it isn’t facing the TV to spur conversation away from electronics. Finding a new accent color to center a room around can make it feel entirely new and fresh, even in older homes. When you’re ringing in the New Year, don’t forget about your home’s needs. You can make a few resolutions and make your home feel totally new. Not only that, you can improve the safety of your home, ensuring the health of your family. Call Integrity AC and Heating today to get your HVAC system inspected, repaired, and cleaned to start 2018 off on the right foot! We hope to hear from you soon!